﻿ HuntingNut » Forums » Firearms, Shooting & Reloading » Reloading Ammunition » What gives on the ogive?? What gives on the ogive?? Posted: Mon Dec 24, 2012 7:08 pm Post subject: What gives on the ogive?? Please excuse my play on words. Anyway, I've been getting different readings on the OAL on my reloads here recently(when using sierra bullets). I mainly load for rifle, 270 Win, 270 WSM, 30-06, and such. I have a bullet comparator and could not get constant readings from my sierra bullets. 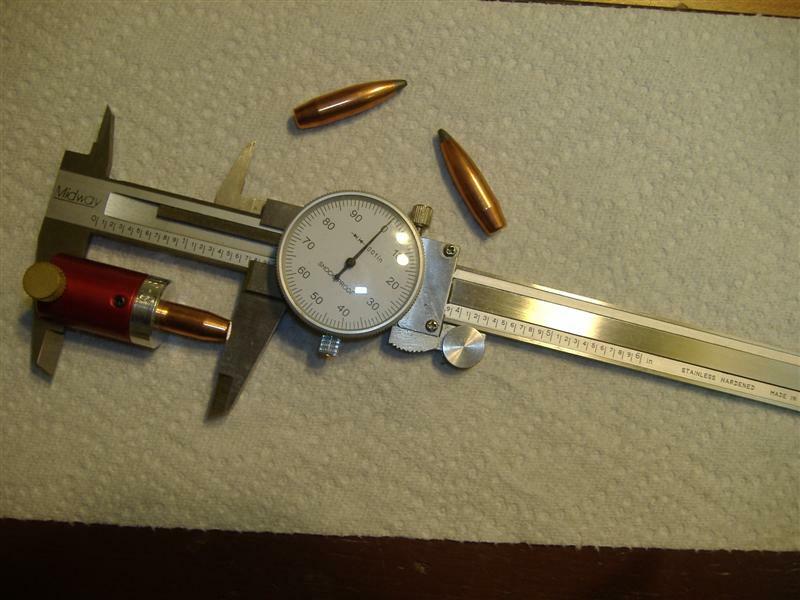 Today I had an idea and took the comparator and measured 10 bullets, from the base of the bullet to the ogive. I should get close readings, right? Well, the sierra 165SBT's had a difference of .023" . Bulk remington 165 core-loks were .010". Barnes TTSX 180's were .004". I didnt realise the sierra's ogive differed so much from bullet to bullet. That would mean a VERY inconsistant bullet jump. I wonder if this is a quality control issue? What do yall think? Browning X-Bolt in 30'06. The work for a pet load starts again. The more people I meet, the more I like my dog. Posted: Mon Dec 24, 2012 8:00 pm Post subject: Re: What gives on the ogive?? Hmmmmmmmmmmm that's very interesting. I want to watch this closely because the bullet seater die should seat every bullet to the same OAL. Maybe I'm missing something here. The difference in ogive measurements does seem to be excessive. I have never used a bullet comparator so I can't offer any expertise in this department. Posted: Mon Dec 24, 2012 8:25 pm Post subject: Re: What gives on the ogive?? If I noticed a difference that large I would be on the phone to Sierra about it. Having said that I would first check to see that my bullet seating process wasn't causing the bullets to bulge as they are seated. Douse the nose of the bullet touch the seating die? I drill my punches and make sure that the punch actually pushes on the ogive rather than the tip because some bullets will deform if there is just a bit too much pressure put on the nose. Use you comparator to measure just the bullets - right out of the box then check them again after seating. I bet you will find that the seating process is the reason and not the bullets. Posted: Mon Dec 24, 2012 9:12 pm Post subject: Re: What gives on the ogive?? Paul, I first noticed them after seating the bullet in the case and found out it was only the sierra's doing it. I only checked mine after a friend called me and told me he was having the same problem. My first thought was my "Lee" bullet seater. But I wasnt having any problems with other bullets. So I checked the seater plug, its pushing on the ogive on the sierras. Thats when I pulled new bullets from their boxes and checked them. I guess I'm calling sierra after the holidays. Only reason I checked this besides a friend calling with the same problem, is my new browning x-bolt has a super short throat. The rounds I made for it were supposed to be .010 off the lands. Some were, some were not. Kinda concerned me a tad. Just glad I double checked and just didnt go with the sierra manual's OAL of 3.330. Oh and thanks for your input Paul. Posted: Mon Dec 24, 2012 9:47 pm Post subject: Re: What gives on the ogive?? I think you've found the problem, the bullets. Out of curiousity I grabbed a box of Sierra .358" 225 grain spitzer boattails and measured them with a .30 cal comparator (I don't have a .35 cal). All were within 0.001". Did you two run into a bad batch of bullets? Posted: Mon Dec 24, 2012 10:23 pm Post subject: Re: What gives on the ogive?? I had this same issue with hornady .224 68gr match hpbt,ogive all over the place!I switched back to sierra .224 69 gr match hpbt,and more consistant ogive.Recently i have used hornady 50 gr spsx with terrible uniformity on the ogive,and switched to hornady 50 gr v-max and within .003 all of the time!Maybe bullet makers just want to "dump" the "seconds" on the market from time to time! Posted: Tue Dec 25, 2012 8:51 am Post subject: Re: What gives on the ogive?? Base to ogive should be at +/-0.001". Ogive to tip can and will vary up to 0.010" and more on hollow points. These may not be seconds but were mixed from different lots run on different machine set ups. Sort them or send them back. Just for fun check out your caliper too. It may have a repeatability issue of its own. Take ten measurements of the same bullet to be sure you get the same number. Posted: Tue Dec 25, 2012 9:18 am Post subject: Re: What gives on the ogive?? Dawgdad, you have a good point, maybe different lot#'s. I did notice some of the sierra bullets jackets were darker than the others. Almost like it may have been a slightly different alloy of guilding metal jacket. I checked the caliper, its repeatable. I have nothing to do today except the present thing tonight at my MIL's so I'm gonna play some. 100% chance of rain with tornado's today so I aint in da woods. Posted: Tue Dec 25, 2012 10:33 am Post subject: Re: What gives on the ogive?? Figured it out. 2 different lot #'s. I was able to seperate the bullets by jacket color. Bullets on left are newer purchase and measured .556 ogive to base. Bullet on right with a darker jacket measures .565 ogive to base. I only had 10 or so of the darker jacket bullets left so I just put them in with the new ones. I guess the dies at sierra really do wear, enough to change the ogive .009". Once I got them seperated, the ogives measured less than .001 difference. I did re-measure my comparator 10 times and only was off once by .0005". Posted: Tue Dec 25, 2012 2:13 pm Post subject: Re: What gives on the ogive?? Posted: Tue Dec 25, 2012 3:56 pm Post subject: Re: What gives on the ogive?? Good detective work there! Stuff like that is one of the reasons I like this bunch. Posted: Tue Dec 25, 2012 5:47 pm Post subject: Re: What gives on the ogive?? I had a good friend that is an engineer that visited Sierra factory in Sedalia. He watched the way they set up the bullet swages and could see that you would have some lot to lot variation but should be very tight within a lot. Posted: Wed Dec 26, 2012 11:46 pm Post subject: Re: What gives on the ogive?? I had the same thing happen today while loading some 224 50 grain Nosler Ballistic tips. I just about lost my mind. I guess I'm going to have to get a bullet comparator. Posted: Thu Dec 27, 2012 1:09 am Post subject: Re: What gives on the ogive?? Welcome aboard The Nut trkygyd. Grab a beer and pull up a log. I must admit, I've never been one for getting so deep into the whole measurement thing. So long as my rou8nds are consistent enough to provide me "minute of deer", then I am a happy man. But if squeezing every ounce of accuracy out of a load is what floats ya boat, then far be it from me to criticize...that is one of the joys of handloading and shooting. Posted: Thu Dec 27, 2012 12:10 pm Post subject: Re: What gives on the ogive?? Just checked an unopened box of Sierra 30 cal. 165gr. Game King boat tails and out of 10 bullets measured had only .001 variance as well with my comparator on a set of Mitutoyo digital calipers. It's not whether you win or lose... It's how you place the blame .